What's New in the iPhone 8 and iPhone X? The first big difference between the phones is in their prices. The iPhone 8 starts at $699, while the X starts at $999. That $300 gap is itself the price of a mid-range Android phone such as the Sony XPERIA XA1. 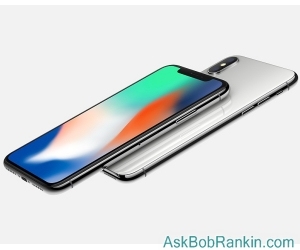 What does the iPhone X have that the 8 lacks? The iPhone X has a 5.8-inch True Tone OLED, 2436 x 1125 pixels (458 ppi), 82.9% screen-to-body ratio. The big difference is the display technology; OLED (Organic Light-Emitting Diode) works without a backlight, enabling deeper blacks and higher contrast ratios than any LCD, while reducing battery drain. The more than 1-inch difference in display size (from the iPhone 8 base model) is also significant. The iPhone X is being touted as "bezel-less," meaning the entire front face is all screen. A bezel is a metal ring or frame around the edge of a computer screen, watch, or smartphone. The iPhone X has no bezel, and a glass back that permits wireless charging. I’m not too impressed by the other display specs of the iPhone X. There are numerous “nearly bezel-free” phones on the market already. Higher resolution is available in the Samsung Galaxy S8 (2960 x 1440) and the LG G6. You might need such high resolution for virtual reality applications, but for watching Netflix or texting, it seems like gross overkill. The iPhone X has a large notch in the top edge of its display, which makes viewing full-screen images or videos rather odd. That notch accommodates two cameras and several sensors that are used for Face ID, Apple’s face-recognition security feature. Also, the Touch ID fingerprint sensor is gone from the screen’s bottom edge, which is going to frustrate many users. Under the hood, the iPhone 8 and X are virtually identical in processing power, with the exception of an extra gigabyte of RAM in the iPhone X. But the iPhone X has more hardware and software to drive, so real-world performance of the two phones should be roughly equal. That performance will remain industry-leading. Apple claims their A11 chipsets deliver 25% faster CPU and 30% faster GPU (graphics) performance than the A10 in the iPhone 7 and iPhone 7 Plus. The A11 is also 70% faster when multitasking. Apple phones’ battery life has not improved much since the iPhone 6. The iPhone X claims significant improvements in talk time (21 hours v. 14 in the iPhone 8) and audio playback (60 hours v. 40 hours). But there’s no difference between the phones when it comes to Internet use, video playback, or fast-charging time. Apple has finally added wireless charging to its iPhones, which are now compatible with Qi wireless chargers. Wired fast-charging takes the new iPhones from zero to 50% of battery capacity in 30 minutes. However, fast-chargers cost extra ($49 to $79) and don’t even come with the required cable ($25 to $35)! Another big change coming with the iPhone X is the user interface. Apple is eliminating the Home button, and new swiping gestures will have to be learned. Instead of pressing the Home button to switch apps, you'll have to swipe up from the bottom of the screen. To access the Control Center, you'll need to swipe down from top right corner of the screen. To access your notifications, swipe down from the top left. The lack of a Home button and all that swiping may become second-nature after a while, but it's sure to confuse people switching from Android, and older users who often gravitate to Apple products for their ease of use. The number one complaint I hear from people about computers and smartphones is "Why do they have to keep changing how it works? I finally learned how to use the darn thing!" As for the the iPhone 8, it seems only marginally better than the iPhone 7. They look almost the same, except for the glass back on the iPhone 8, which enables wireless charging. The camera on the iPhone 8 "reproduces colors better" but resolution is still 12 megapixels. And what of the missing iPhone 9? Apple says it was skipped to honor the tenth anniversary of the original iPhone. Some cynics suggest that the skipped generation is intended to make iPhone 6 and 7 diehards feel even more behind the technology curve. Others (like me) thought, "Hmmm, didn't Microsoft skip Windows 9?" Apple says the iPhone 8 will be available starting September 22. The iPhone X will debut on November 3. It's no skin off my nose, but I wonder if the iPhone 8 will be a marketplace failure. I say that for two reasons. First, it's a ho-hum upgrade from the iPhone 7, as I explained above. Second, it will be eclipsed by the release of the iPhone X only 6 weeks later. If you want the latest and greatest, who is going to buy the 8, when the X is the newest, coolest iPhone? Maybe the answer lies in the price tag, but I predict a strong market for used iPhone 7s. Most recent comments on "Is This iPhone Madness?" What happens when you unlock via face recognition then hand it to someone else? Will it lock out? It's my wife's turn for an upgrade, she has a 6 and I have a 7+ and we have been alternating. I'm thinking of getting her the X because she doesn't like the large + model, but could have the larger, brighter display with very little change in overall size. I'm hoping to get some input in the glass backed durability of the X before I order, though we always have gotten cases and screen protectors. My main problem (besides sticker shock) is that I don't think she really cares what phone she has. The main points in favor of the upgrade is the superior camera and battery life. Because she has a better eye she already takes pics that are superior to most of mine. I have iPhone 6 still working well. I need none of the new "features". It is annoying that with each version they insist on removing the internal storage "sweet spot" to try to force you to buy the phone with more capacity. Shameful greed from billionaires! I will probably keep using my 6 until it stops working. Who knows maybe the iPhone 13 will see the return of the headphone jack. On the other hand 13 will probably be skipped as frivolously as 9! I will never consider another Apple product.I had an(old) 3gs model worked for what I wanted it for,then earlier this year they upgraded the ios,it killed battery(which I'd replaced at beginning of the year)so had to replace again now it's stuck on grey screen searching,tried connecting to itunes to reset comes up with problem please contact nearest store to arrange for repair(for which the want to charge more than upgrading to next model iphone4)not impressed...! My phone still does everything I want. (Samsung S4). Now why would I want to spend money I don't need to? I'll just put another $1000 in the bank, and pretend I bought an iPhone X.
Gosh, my wife still thinks her iPhone 3 is doing great and says why switch. What fool would spend all those bucks for iPhone 4,5,6,7,8,X when what you already have does the job nicely. Guess that's why I use a flip phone that should have seen its battery die years ago - but it didn't. Add up all those dollars not spent and laugh. Went to a restaurant last night and 7 out of 10 customers were phone addicts who just could not stop looking at their every 15 seconds! Bet they will need an iPhone X just to feel good. The first smartphone I ever had was an iPhone 4S and it was my phone all these years until yesterday. For some reason, it NEVER was able to make a secure hands-free connection with my Infiniti's Bluetooth and I finally tracked the problem down to my PHONE, not to AT&T, and not to the car. So I needed to get a new phone that actually would connect with my car. I researched everything and decided on an iPhone SE, which is basically a 6 in a much smaller body (close in size to the 4S; fits in my pocket). I don't like those huge SLABS of phones they are making now. The SE cost me in the neighborhood of $400, whereas even a discounted 6 (now older than models 7, 8, and X) was for over $600.00. I am happy with this purchase and now my Bluetooth connection is crystal clear! I would expect the 8 to not sell well (remember the Osborne portable computer that went out of business because they too soon advertised their latest model and so their cash flow stopped instantly?) but who knows? That $1,000 price point is REALLY high, so if the 8 is nicely under that, then it might have a market. If it is over $1,000, then only those who can't wait for the X release will spring for it. Also, believe it or not, color choices make a difference for some (me, for example). I think the 8 and X do not have good color choices... when one gets a new phone, they also care about its looks. My SE is a beautiful gold. If it only came in black or gray or white, I would not have gotten it. I wanted it to LOOK new. And I didn't want rose gold, as pretty as that is; I didn't want my phone to look like something my wife would get. Being the last hold out and black sheep of the family, I finally replaced my beloved old Droid Max with an Iphone 7 so I could get the most functionality out of my new hearing aids. Nice phone but I will say that IOS users tend to get excited over new features offered by Apple that have been around Android for years. My 3 year old Android had wireless charging, a display as good, if not better than the Iphone 7 and a more sensitive phone receiver (I now enjoy some dropped calls). I give the Apple people credit for their ability to get millions of dollars of free advertising from the media. They are the World's greatest marketers and have super customer service in their stores but I am not sure that they necessarily have the best products. I currently have the iPhone 6s+ and look forward to switching to the new iPhoneX. I have enjoyed up to this point being on the interim upgrade side of the iPhone world as the incremental improvements have been great fro me and I have never experienced the brand new model problems that my wife has sometimes experienced being on the new model side of the typical 2 year cycle. I believe it is somewhat unfair to call the iPhone 8 and 8+ the incremental upgrade as although the form factor is similar to the 7 and 7+ there are very significant differences in design that make the 8 a true version upgrade. Shifting from the aluminum back and glass front to the glass front and back, wireless charging, improved water proofing, improved camera with new features, etc., etc. My wife skipped her last upgrade cycle from the iPhone 6 to the iPhone 7 because she retired from her job and was no longer supplied a new phone every 2 years AND she just no longer uses many of the advanced computing features of the phone (it now being mainly a phone, Face Time, Facebook and email device for her. However the attractiveness of having a 8+ size screen on the easier for her to handle 6,7,8 dimensions may cause her to make the same leap to the iPhone X. My experience has been that if I buy the absolute top of the line current phone every two years under contract with the Carrier (in my case AT&T) with the most Storage Available in the most popular color (in my current case this would be the Gold iPhone 6s+ with 128 GB of storage) that I have consistently been able to upgrade to the next top end model with no money out of pocket for the new phone after I sold my previous model. Last upgrade cycle I ended up out of pocket $85 because the 6s+ changed both maximum storage and form factor. I suspect this year I will end up perhaps even $150-200 out of pocket due to doubling storage again and paying for the OLED Screen, better form factor, etc. As I develop Apps and content for the iOS, OSX (Mac OS), Apple TVOS and Windows markets, this is a small price to pay imho. In any case after 7 years in the Apple iPhone universe, other than paying for the original IPhone 3S (which actually was largely Carrier Subsidized) and having an anticipated total net investment of $300-$350 for iPhones over 8 years I believe those that complain of the cost of iPhones simply do not understand the market value of used iPhones. Now I have certainly spent more than that for cables, cases, screen protectors, etc. but my used iPhones have always generated top dollar in the local used market because they look brand new when I go to sell them and I have always had the most in demand version of whatever model iPhone I was selling used. Any consideration of the value I get from having the current top of the line model for testing apps, content presentation, etc. and my particular iPhone trading methodology has certainly worked for me. Laurie I bet it does not include the Monthly Subscription cost for phone service. I pay all of $85.00 Per month for my Unlimited everything along with q !2" and a 18.4" Tablet also at times for my 7 Computers when my Ethernet goes out. When I go out to dinner or shopping my phone is turned off as it is very annoying to get popups for special sales or an all you can eat Buffet. My friend he can not resist checking his phone every 5 minutes to check the scores on all our losing teams etc. In fact he comes over to my house before we go out or after and after giving my cats their treats, one of the cats now just sleeps through the first part of his visit and greets him when we come back. The entire time he spends checking his cell phone. I also had a number of friends who would come over to watch a movie and spend their entire time on the phone texting. The worst is my son in law who cant stop texting while driving and carries my most precious possession my Granddaughter and his widowed twice Mother. They finally made him stop it. My Granddaughter wants to earn to drive , but neither Grand mom or Dad want her to. they say it is dangerous. I offered to teach her but they said she will never need to drive. Maybe someday when she gets married her husband will teach her, she is just 20 and more interested in College. I had a couple of Notebooks that had fingerprint readers and what a nightmare they were. Several tablets too, I gave them away. just refused to install them. When Credit cards go to eye scan I will close them out, these new security chip cards often malfunction when paying for something and I have to try more cards. Turning of the chip reader may work. One of my Gas Cards at Citgo will not work at the Pump or in the store, have tried many times. Citgo says to call them> I have no time to wait on hold. My New WAWA Card works, but none are in the area where I Usually drive but a new one is opening up less than 250 feet from my house and a Citgo is just across the street that the card work at the pump. I believe we have reached the point where technology is no longer useful to humans. Each 'giant' leap in technology is really only a slight lessening of worldly 'inconveniences'. Or worse - it now takes 2 people to do the grocery shopping - 1 in the store buying and 1 FO (forward observer)at home. I can't wait for a full power grid meltdown to see how this latest generation survives in the streets without their iX. Hi Bob, I have been considering a switch back to an iPhone from my Samsung android because I like the way the iPhone works. I was considering the iX until I read the many blogs on your website. I have an i3 that I wish I could breath new life into but since it is so far behind the curve I think I will go to an i6se or i6+. I don't need all kinds of fancy camera work as I have an outstanding Sony video camera for that. I don't do any facebook and I rarely text unless it's important so I really don't need many special features. And no I don't check my phone every minute or two, it goes in-noticed unless someone calles me. I do want a clear screen, good reception, good sound (no I don't listen to music on my phone) and sometimes the ability to search for a subject on the web. I want to thank the contributors to this page for all the insight that I have enjoyed. Larry. Steve Jobs would be ashamed. This is the Apple IIe all over again when the Mac is waiting to be born. For good reasons, Pappy used to say "Don't spend other people's money!" But when he wanted to give me a rough time about spending $2,500 for a pair of Vandersteen speakers, I had to remind him of his DSOP$ rule. Production cost of an iPhoneX is being estimated between $410 to $580 (MSRP = $999). Production cost of Samsung S8 is ~$308 (MSRP = $730). Most expensive part of the EKS is the OLED display (sourced from Samsung) at a cost of over $110. Is it just me or is there no i"Phone" advantage over my 7 year old motorola defy? Does it pick up weaker signals? Can it make/receive calls when others cant? Does it's on screen keyboard work any better? Can you look up contacts any faster? Are calendar entries any easier? You mean to say it's no better a phone? And there is no need for me to buy one? Between computers and mobile phones the NSA/CIA know what you had for your breakfast. The next device to replace the IPHONE will "blow your mind"! That's what it is intended to do! If the NSA/CIA think you are a problem, they will use "your" devise to send information into your brain and it will "scramble" it. Think long and hard about buying this device! British spy agencies worked with the CIA to turn televisions and smart phones into bugging devices that can record conversations and even take photographs, according to leaked intelligence documents. The CIA is accused of running a secret computer hacking programme giving its agents access to everyday items including mobile phones, TVs and iPads. The CIA is also alleged to be targeting cars that contain on board computers linked to the internet, amid unsubstantiated allegations that once in control of vehicles it could stage assassinations and make them look like accidents. My 6s is fine and I'll finish the monthly payments in the spring and then will hopefully have a good 2 more trouble-free/paid-in-full years more with the 6s. As always, Bob, great stuff you're writing. Much appreciated.